Leica is well known for the iconic M-series rangefinders but they also make a range of highly desirable compacts in conjunction with Panasonic. This fetching high-end model is based on the Panasonic Lumix DMC-LF1 which includes an impressive optical image stabilized Leica DC Vario-Summicron 28-200mm equivalent f2.0-5.9 zoom, rear illuminated 12-Mpix MOS type sensor and a built-in 0.2” 200k dot electronic viewfinder (with +/-4 diopter adjustment). In addition to the EVF there’s a large 3” TFT type LCD with a high-res 921k dot panel but perhaps unsurprisingly in a compact camera as small as this it’s fixed rather articulated. Few cameras these days are without movie capture and while this model has full HD video recording 1080p at 30/25 fps (NTSC/PAL) in AVCHD and MP4 formats, video features are somewhat limited. Nevertheless as a more stills-oriented model the Leica C has built-in WiFi with NFC, and both electronic and mechanical shutter operation up to 1/4000th sec with continuous shooting of up to 10fps. There’s also a good balance of manual control with an exposure mode dial on the top plate and a multi-function control ring surrounding the lens. 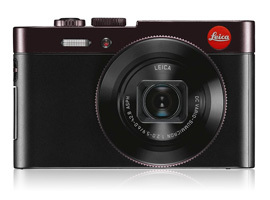 The Leica C 4.1 x 2.5 x 1.1″ (103.0 x 63.0 x 28.0 mm) and weighs 6.88 oz (195 g) and is available now at $699. 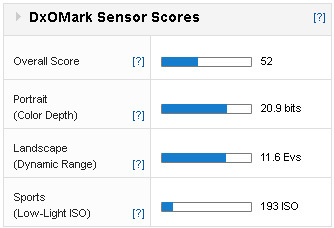 The small 1/1.7 in 12-Mpix sensor in the Leica C achieved a DxOMark sensor score of 52 points, a good score for this size sensor but it’s a bit low when compared with larger sensors. Color sensitivity at 20.9 bits is a bit on the low side (although not for this size sensor) while an 11.6 Ev dynamic range is very good and exceeds some models with larger 1-inch type sensors. Low-light capabilities are restrictive with the Sports score of 193 ISO being quite typical for this class/format. At around $800 there are some pretty impressive rivals. Both the Sony Cyber-shot DSC RX 100 III and the Canon PowerShot G1X Mark II have sensors with a far larger surface area, giving them a distinct lead in performance, particularly with low-light capabilities. 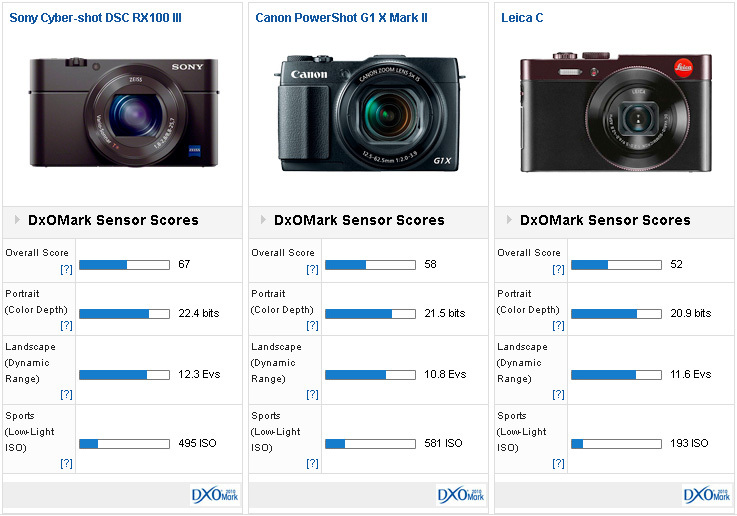 The best performing of the three is the RX100 III, even though it has a smaller sensor than the Canon. It has the best DR and color sensitivity and is close to the much larger Canon unit in noise. In fact, with 2.8x the surface area of the Leica, the Sony sensor has +1.33 stop advantage while the 5.8x larger Canon CMOS sensor has a +1.66 stop advantage. As for DR, the little Leica has +1/3 stop wider DR than Canon and is only -2/3 stop behind the Sony at base ISO. At higher ISOs, however the Leica doesn’t fare so well. And neither can the Leica C can’t match these models for Color either with the Sony having around +1 stop increase, and the Canon around a +1/3 stop more. 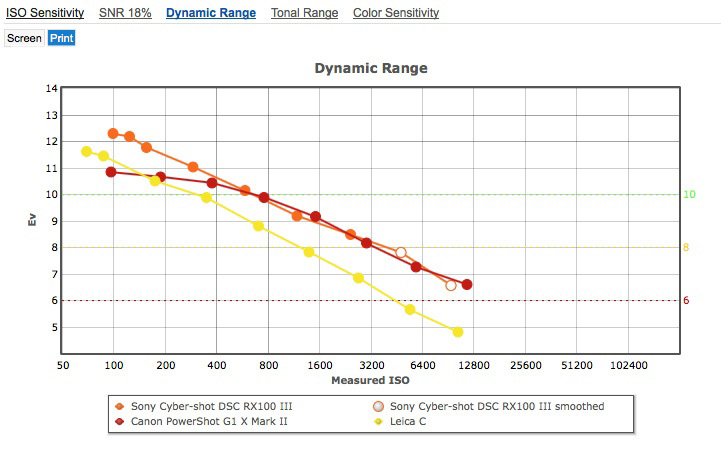 The Leica has a wide dynamic range at base but at IS0400 and higher it loses out to the Sony and Canon sensors. 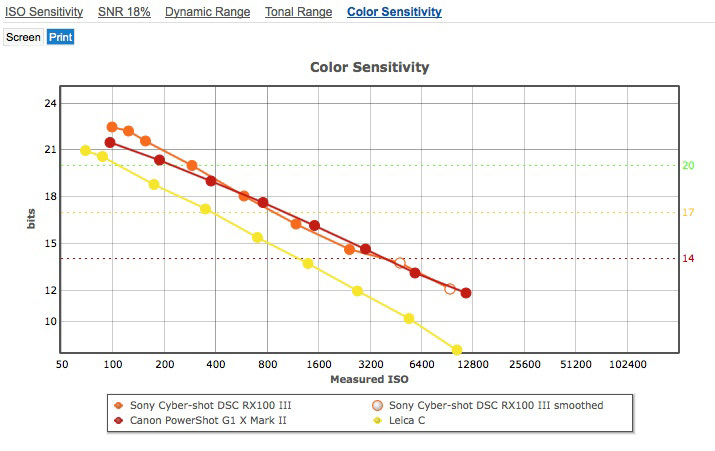 Color sensitivity is good at base ISO but it can’t match its larger sensor rivals. With the stabilized zoom and EVF it’s an appealing camera but while the Leica C is a good performer it struggles in comparison with similarly priced, albeit larger sensor rivals, particularly in low light and at high ISO settings. As a compact camera it’s an attractive option although it looks expensive when compared to those models. If the badge isn’t important the functionally equivalent Panasonic can be had for around $200 less and has similar sensor performance, though it, arguably, struggles to match the Leica C’s elegance.